Stamp By Me is a Battle minigame in Mario Party 6. Its name is a pun on "Stand by Me," the title of several works. The introduction shows the first player stamping one stamp, which does not count as a point. 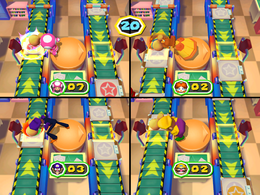 Players must stamp pieces of paper as they pass by on conveyor belts, and must stamp the most papers to win. Each player is given a a giant, hammer-like stamper. Every time a stamp would pass on the conveyor belt on the side of a player, they should press either , or , depending on which conveyor belt it was on. The player should press for the right side and for the left side. In addition, both conveyor belts move at different speeds. There are a total of 27 stamps. This minigame appears as the last minigame in Decathalon Park. Here, the player's objective is to stamp as many papers as possible to earn as much points as possible, up to a maximum of 1,000. The default record for this minigame in Decathalon Park is 10 points. The players do their winning and losing animations. Rules – "Stamp the pieces of paper as they zoom by you on the conveyor belt. Whoever stamps the most correctly wins!" Advice – "The left and right conveyor belts move at different speeds. Keep this in mind to find the right stamping rhythm." This page was last edited on March 27, 2019, at 00:32.